Lipo or Lithium Polymer battery are not like the normal AA or AAA batteries. 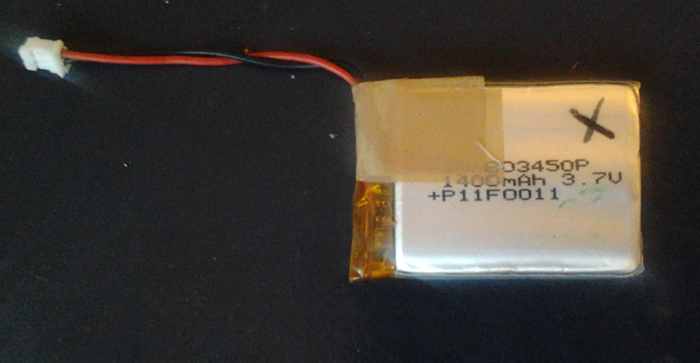 Unlike AA batteries at 1.5V, the lipo has a voltage of 4.1V. Decharging will make the voltage drop to 3.6V, where you should stop – normally there is protective circuit on the lipo to do this for you. Because the lipo’s are flat it is nice to use these in e-texile projects. But the lipo’s must be handled with care. If the lipo is busted or punctured it could start smoking or even start a fire. Also overcharging can have these effects. Using lipo’s in series to get a higher voltage must be done with care. At 12V or 16V (4 lipo’s) the energy is high enough to start a fire some of the wrong wires touch fabric or heating materials. This is totally different from the 5V from the USB or the Arduino. Charging series with lipo’s must be done with special balancing chargers: We used a 2A 12V adaptor and the VOLTCRAFT E4 charger. I noticed that some lipo’s where not working and saw that the yellow transparent tape at the top was a bit open at the wires. Taping it off made the lipo working again. Now I tape the lipo before working with it. 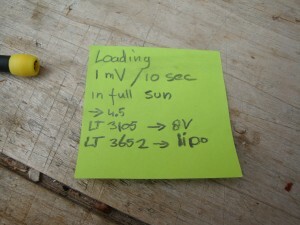 Energy of lipo’s: this is indicated as current*time. 1400mAh means you can get 1400mA during one hour at a voltage between 4.2 and 3.6V. 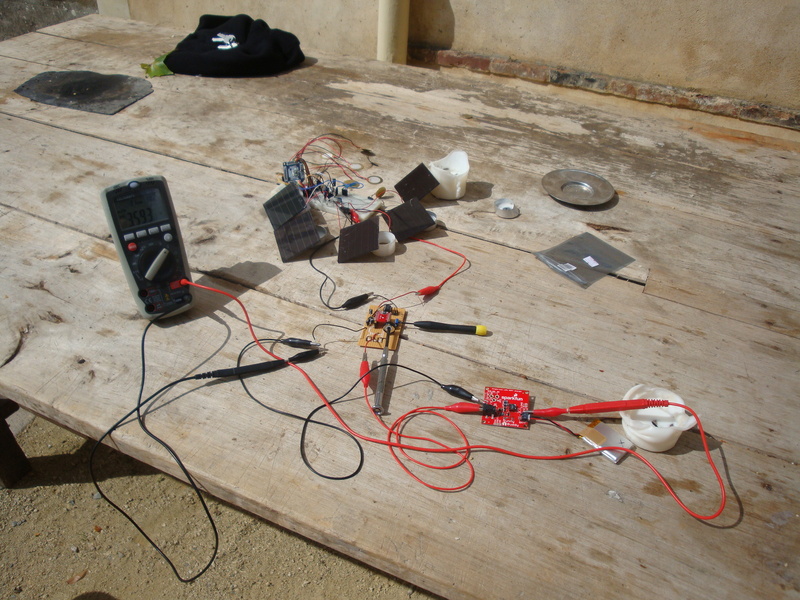 In principle harvesting is done with tiny energies, so a lipo is huge. You can only charge a lipo with huge energies. 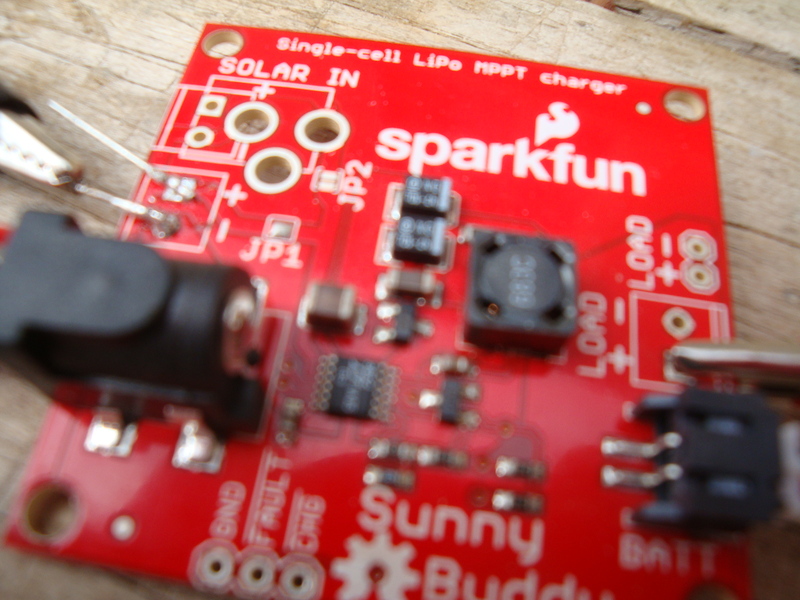 There are boards for charging a lipo, like the Sunny buddy, with an LTC3652 of Sparkfun. Remember that charging a lipo with a normal charger and an adaptar at the mains already takes hours. 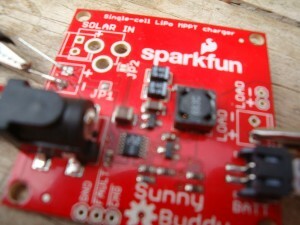 So it will probably take even more hours of sunshine to charge this lipo. 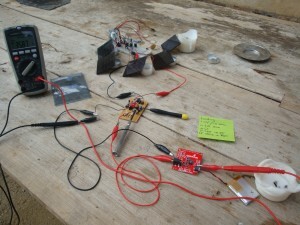 Also you need solar cells which provide lots of energy.